Summer means tailing reds in the grass. We have had some great tides the past few evenings. In May we caught them on spoons, toads and the Stealth Bomber surface fly. The video below was taken almost 8 years ago, but the fish are still tailing. This is classic, Southern Fly Fishing for Red Fish. I have a few days still open in August, September and October. Give me a call if you are interested in reserving you day. For the 4th straight year, I am hosting a trip to Casa Viejo Chac in Punta Allen Mexico. This is six days fly fishing for Bonefish, Permit, Snook and Baby Tarpon. This is an amazingly affordable trip. In the last newsletter, I detailed the 2018 trip with lots of photos. If you did not see it, here is a link to that Newsletter. I still have room for a few more anglers. Here is a link to a Google album of more pictures. Join us next year. This is a surprisingly affordable trip. March and April were two of the toughest Spring fishing months I have ever had. Either the wind was blowing, it was cold or it was rainy/overcast. I cancelled more charters in March because of the weather than I ran. The weather started to stabilize in May, and the fishing turned on. Triple Tail are our Spring Bonus in the Golden Isles. They arrived in good numbers the beginning of April, May saw lots of fish, but smaller fish. I have been fishing for Triple Tail and getting lots of shots and eats into July. Sometimes they will eat any fly, but most of the time they want something natural looking. My go to fly last winter for Reds was the Winter Time Red Fish Fly. It works great for triple tail, too. I had detailed tying instructions in a previous newsletter. For those who missed it, here is a link to that Newsletter: Winter Time Red Fish Fly The other fly that works well is the Prawn's Revenge. 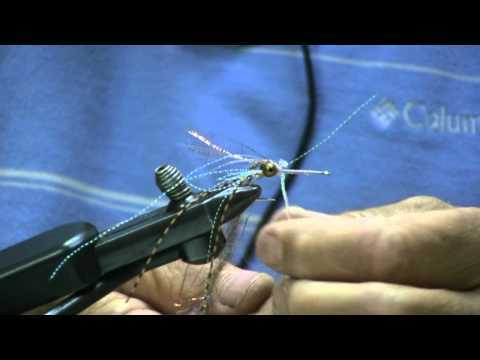 Below is a video on how to tie the Prawn's Revenge. This video is also several old, and I look really young in it. Years in the sun puts age on the face. May, June and early July brought great fly fishing for red fish. We had some nice tides in May for tailing fish. In June and into July we have had some great morning low tides for reds on the mud flats. If you can time a trip for red fish in the summer so it coincides with an early morning low tide, you can have a blast. I have been meeting clients as early as 5:30 to be on the flats at sun up. At that time of day, we are greeted with schools of red fish pushing water and chasing bait. If you can put a fly in front of them, your drag will scream. Later in the morning as the tide has started coming in, I usually move to another flat, where we normally see school after school of fish moving onto the flat as the water rises. As long as the wind is down, which keeps the water from being terribly muddy, my clients have been catching some nice fish. I had an 11 lb red fish brought to the boat last week. It was the first time this client had ever had a fish take him into his backing. Fishing will be the same for the next few months. We will have some great tailing tides in August, September and October. But if you can't make it then, on almost any day, I can put you on red fish on the low tide. We had a few days when the water was too muddy for a fish to even see a fly, much less bite one. That is where my Parker 18' Center Console helped save the day. The plan was to go to an artificial reef and troll with live bait for King and Spanish Mackerel. Then when we got into them thick, to live chum to get them fired up and through a fly at them. Well, that never happened. But we brought several back for the dinner table. While running in, we came across large schools of small spanish mackerel. They were keyed on some small bait, and I did not have any flies small enough for them. We managed to get a few bites on Clousers, but never hooked one. There was a good trout bite at times on Cumberland Beach and some caught in the rivers. We have caught a few blind casting flies for red fish on oyster banks. I don't fish hard for trout until the Fall. Lots of whiting have been caught this Spring, and the bite continues into the summer. Flounder are also being caught. Summer season is in full swing, and the fishing is as hot as the weather. Call, text or email if you are interested in booking a trip. 32", 11 pound Red Fish. It takes a 10 lb fish to take you to your backing, and this one did just that. Due to the cold weather in January, there is evidence that speckled sea trout suffered a minor cold kill. After the winter of 2009/2010, when there was a large cold kill, Anglers practiced ROE-Release Over Eighteen. These larger trout are prolific spawners. If we protect these important fish, the sea trout fishing will rebound quickly. So if you go trout fishing, keep a few 14-15" fish for dinner and let the others go, especialy the ones over 18". If you are planning a trip or coming to a corporate event in the Golden Isles later this Summer or Fall, now is the time to call and reserve your days. September, October and November offer spectacular fishing for red fish and trout. If the weather stays warm and calm, trout fishing can be off the charts in December. In the fall, combined trips for red fish and trout make for a fun day fishing. Give me a call at 706.540.1276 or send an email to flycastcharters@gmail.com and we can get started. There is a ton of information on my website with tips and techniques that make you a better angler and many good fly recipes if you tie flies. Or just go to the front page to browse the site: Fly Cast Charters. My old silver Toyota Tacoma pick up tuck served me well for 10 years. But it was time to say out with the old and in with the new. Here is a picture of my new, tricked out Tacoma. I like to think it is the best looking truck in SSI, and it still has the familiar stickers on the back window. If you see me riding around St. Simons or anywhere else and see my truck, stop me, say hello and let's talk Fly Fishing. The photo of the back window of my new truck has the reflection of the fly rods hanging on the wall of my garage. I am a total rod and line maniac. I don't know how many rods or different lines I own. 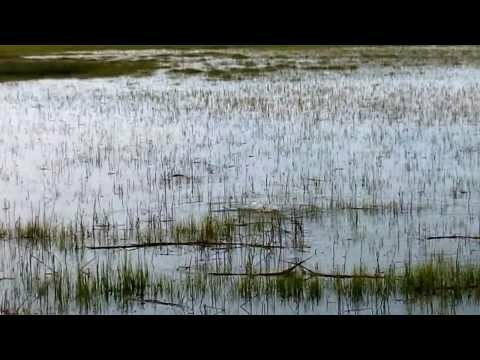 "Hunting Fish in the Marshes of Glynn."